Elements Applied: Bark is the main part considered potent in herbal medicine. Used For: Commonly alder is used as an effective laxative remedy. It is potent of eliminate constipation producing the same effect as rhubarb. With no harmful consequences imposed on the organism the remedy can be applied for all cases and reasons of constipation. What more, the herb can’t be blamed for leading to reappearance of the condition, nor it becomes weaker when applied for the second and further times. Taken under doctor supervision, a combination of herbs including alder, milfoil, senna leaves, and the root of witch-grass is considered efficient to treat the condition. Tea made of alder buckthorn is known to reduce colic, hemorrhoids and help in treating dropsies and obesity. Additional Info: Found in the northern parts of the USA and in Europe, buckthorn is a bush which height reaches 20-25 feet. 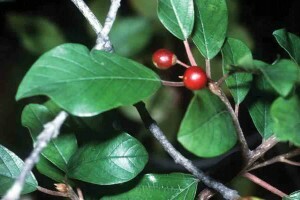 The plant commonly appears in swampy areas. The branches have a tendency to get wider as they grow and change the color of the bark from green to brownish. Green obovoid leaves have no fuzz on them. Flowers are green-colored and have five petals. The fruit has three seeds and gradually changes its color from green to red and finally deep purple as it grows. Preparation and intake: To produce the maximal effect the bark you take should be from 3 to 4 years of age. The effect is weak before it reaches this age, as well as a year after it gets ripe for medicines. To make a decoction 1 teaspoon of bark extract is mixed with a half a cup of cold water and boiled. Applied in the evening before sleep. Half an ounce of bark extract is a daily dose. Alternatively, you may let the bark extract infuse on cold water for twelve hours. The remedy is also taken before going to bed. In form of a tincture the average dose is that of 10 drops (the highest is 20 drops). Safety: Warning! Green fruit and fresh bark are able to produce a poisoning effect. If kept for a year before use or warmed up to 212 F the extract is safe to take. The use in course of pregnancy is not recommended.